Ivan the Terrible, Criterion #88. [Ivan Grozniy] = Ivan the Terrible. Referred to by Criterion as Ivan the Terrible, Part I. 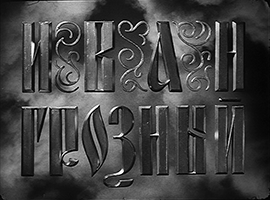 1943–44, premiered 1944. On the left is the DVD version. On the right is the FilmStruck version. The DVD version is a restoration from 1987; the FilmStruck version is a restoration from 2014. Obviously the 2014 picture is far better, but the subtitles are burned in, and I wanted a clean image, so I went to grab the identical frame from the DVD version. Turns out there was no identical frame to be found in the DVD version; the smoke in the background was completely different smoke. Uh-oh! More on this subject below. [Ivan Grozniy. Skaz vtoroy: Boyarskiy zagovor] = Ivan the Terrible. 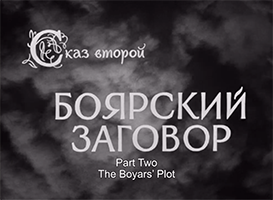 Part Two: The Boyars’ Plot. 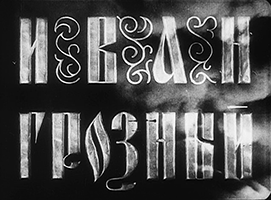 Referred to by Criterion as Ivan the Terrible, Part II. 1944–46, but suppressed upon completion. Finally premiered in 1958, and thus receives the misleading date “(1958)” in Criterion’s database. A corny and unrepresentative American trailer (presumably from 1959). A hundred times more rewarding than Alexander Nevsky, you’ll be relieved to hear. Not to say that it’s any sort of fun. 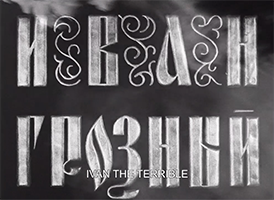 It’s more “really something,” as in “That Ivan the Terrible is really something!” If you’re susceptible to being mesmerized by creative fervor itself, there are genuine thrills here. I think again of Scorsese’s comment on The Red Shoes: that there’s something rare and special about artists being so wildly committed to their own vision, so “out of control.” Eisenstein could never be called “out of control” — control is his métier — but he is certainly far-gone in a strange and intense direction. The two Ivan films, especially the second one, seem to me a major achievement of the same species as the The Red Shoes: they engage the viewer independent of their questionable meanings. They impress by sheer aesthetic force. It’s built from the same picture-gallery technique, but Ivan works where Nevsky didn’t because of the sustained human intensity. The signature image is ominous, tensed, anticipatory staring. All those intent tight-lipped bug-eyed stares keep each scene pumped with energy. I think this may well be the most bug-eyed movie of all time; really a minute doesn’t go by without someone’s eyeballs flaring melodramatically in tight close-up. In some sequences it’s every single shot for minutes on end. I’m not knocking it; those are the best sequences. 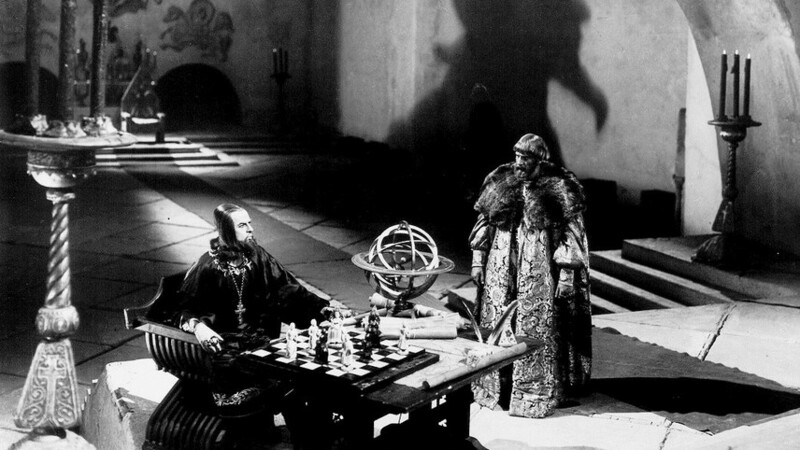 As with Nevsky, Eisenstein’s strongest suit, his essential emotion, is for something to be impending. Here he papers the walls with it. The Disney influence is no joke. The whole production seems to aspire as best it can toward cartoon-dom; grand opera via Pinocchio. And, as with Spielberg, we also sense that the director is a real “boys’ adventure” enthusiast; he likes comic books and pulp, anything that inflates the stakes and then zooms in hard on the object of interest. The attention caroms around the giant sets, gripping fiercely to one exaggerated image after another. James Agee wrote that Ivan the Terrible was “on a scale as ambitious anyhow as that of Shakespeare in his political plays — and more politically knowledgeable and incomparably hotter to handle…” This is an apt comparison. The experience of watching Ivan actually helped clarify for me how to watch Shakespeare’s histories: of course the audience’s thoughts would immediately go to the current ruler. Historical drama can’t help but be a political metaphor for the present. It happens automatically; the writer doesn’t need to lift a finger. The great unavoidable puzzle of this film is what, if anything, it’s saying about Stalin. Remarkably, the subject was Stalin’s own choice; the political metaphor was official. That he voluntarily self-identified with a notorious tyrant created a uniquely terrifying opportunity for an artist to play with fire. In Stalin’s own words: “Ivan the Terrible was very cruel. You can show how cruel he was, but you must show why he had to be cruel.” Does Eisenstein do that? Highly debatable! In addition to the pan quoted above, Orson Welles apparently wrote another column (I can’t find the actual text online) in which he compared Ivan to Wilson — which is its contemporary, bizarre as that is to contemplate — and complained that both films gave their protagonists too many political excuses in the form of would-be humanizing detail. To my mind, it seems like given the Soviet circumstances, the movie gives Ivan impressively few excuses. He grows a devil’s beard and goes around raging paranoiacally and basically acting like Jafar; not generally considered sympathetic character choices. Of course Orson was only writing about Part I; the sense that things are coming off the rails really accelerates in Part II. I don’t possess the historical awareness necessary to untangle the official metaphors from the subversive ones. Maybe that’s the point. The subtlety and complexity of the game is suggested simply by the title: “Terrible” how? What degree of “terror” did Stalin consider flattering? How much villainy was he willing to admit? Dictators want people to cower before them; they also get offended when accused of wanting people to cower before them. It’s a fine line. Knowing what’s at stake for the artists, the whole thing gathers an unsettling intensity for the audience by the end. It feels like the whole thing is “The Mousetrap,” designed to catch the conscience of the king. It’s creepy. The Wellesian ghostliness of it all, the surreal dreamy intensity, becomes the excuse for very gradually turning the proceedings from Stalin’s fantasy to Stalin’s nightmare. One imagines a Ghost of Purges Past leading him through one tableau after another, toward the harrowing red room at the end. 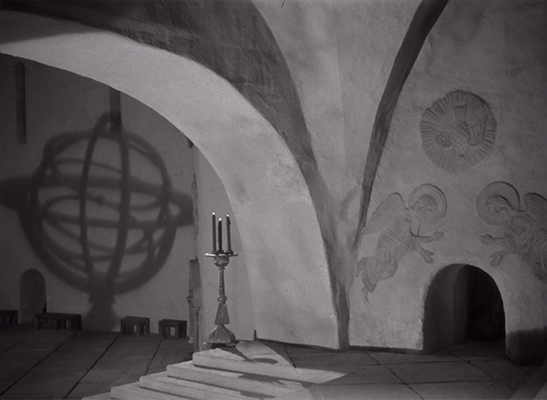 It’s as though after Alexander Nevsky, Eisenstein swore to himself that he would never again be an artistic coward. When e.g. Philip leans right into the camera and growls “justice must be done against the Tsar!,” the sense of high stakes — of the whole production being complicit in something dangerous — is thrilling and distressing. No wonder Eisenstein had a heart attack on the day he finished Part II! In that state of intensity, I found myself laughing a huge loud honest belly laugh when Ivan says “From now on I will be just what you say I am! I will be… TERRIBLE.” and then looks straight into the camera and raises his eyebrow. I’m laughing again now. It’s so great. I’m not mocking it. Just laughing. Of course Stalin condemned it. Eisenstein’s technique just wasn’t well-suited to doling out drama itself. 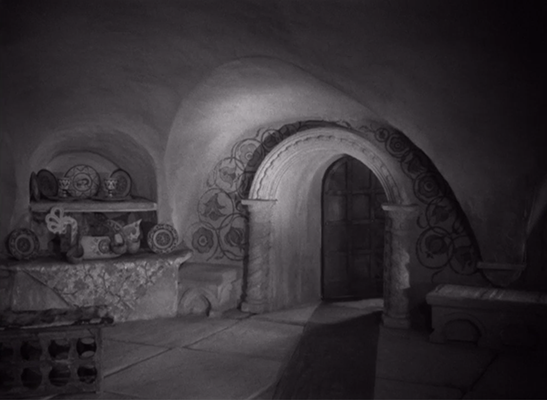 There’s a rhythmic problem: the actual events take up absolutely minimal screen time and are staged with efficiency, while the reactive tableaux are prolonged as long as the visual holds Eisenstein’s interest. I guess that was Welles’s complaint. But from my perspective, it simply means the artistic emphasis is elsewhere. The visual intensity is so strong and the significance of the plot is so ambivalent and obscure that the film plays as though it has some secret meaning, somewhere in the subconscious, beyond the text. These are pure archetypes going through ritual motions, some kind of pantomime mystery play. And then suddenly, good god, it cuts to color! (Spoiler alert.) The effect couldn’t be more shocking. It’s really one of the most intense and disturbing things I’ve ever seen in a movie: it’s like the very premise of black-and-white film, the premise of the dream at its foundation, gets nauseated. The sleeper rolls over in bed and the dream suddenly lurches feverishly into a different part of the brain. Here are the same actors, pale in their black-and-white movie makeup, in a new hellish red world, looking suddenly modern and present, like they’ve traveled through time. It’s a horror. • Nikolai Cherkasov is still just some guy, but he gives a much better performance here. Maybe it’s that he has better makeup and costumes to work with. Someone on YouTube compared him to Charlton Heston. I can see that too. • Intriguing scene where the lead character dies and everybody proceeds to betray him. The audience knows that despite all appearances, he can’t possibly be gone; there’s a sequel, after all! These creates an interesting kind of suspense. Kind of a ghost story in advance: yeah, he sure does seem to be dead, but all the same, these poor fools had better watch themselves! Christ’s giant painted eye watches from the wall to drive home the point. First of all there are “Drawings and production stills,” which in this case are actually rather interesting. Eisenstein sketched everything out in thick black pencil, in a friendly, eager cartoon style with strong lines; it looks sort of like Robert McCloskey or Bill Peet or someone like that, and gives a fascinating alternate angle on a film that can sometimes seem overbearingly serious. The drawings have an innocent spring in their step and help one to recognize the ways the film does too. Then there’s “Deleted scenes,” which includes the complete original childhood “prologue,” including a whole Prokofiev song that was cut from the final version, as well as the one surviving scene from the never-completed and otherwise lost “Part III.” I don’t like quoting the Criterion Contraption guy (who blogged his way through this stuff 8 years ago), but he’s right in pointing out that this orphan scene — which can’t have been very widely seen, prior to the release of this DVD — is restaged almost exactly with Jabba the Hutt in Return of the Jedi. Coincidence? Anyway, this was all worthwhile viewing. And then finally there are two half-hour video essays by scholars. 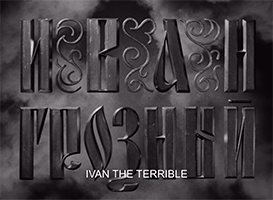 The first is on “The History of Ivan the Terrible” by Joan Neuberger, which is acceptable if a little forced and dry, with an emphasis on the autobiographical element of the film, apparently well attested by Eisenstein. The second is on “Eisenstein’s Visual Vocabulary,” by Yuri Tsivian. This one I thought was quite excellent. He observes a few recurring visual motifs and uses Eisenstein’s sketches and notebooks to show how deliberate everything was, to the Nth degree. Overburdened with shadows? Too much imagery stuffed in? But it is too much only for those who do not read images but merely rush after action. Too much for those who go to the movies for telegraphic syntax, rather than for poetic writing with repetitions, illustrations and music — for those who look for the anecdote alone. Nowadays, in the era of DVDs and beyond, this begins to seem like a viable technique; any detail can always be paused and rewatched at leisure. What’s odd to me is that he was already disdaining those who go to the movies just for “telegraphic syntax” in an era when hardly anyone in the audience would have the opportunity to see a given film more then once or twice. Who was this audience he imagined that would be consciously weighing every hidden complexity? And yet within a few decades they undeniably existed. In some ways it feels like Eisenstein called them into being by writing and thinking the way he did. I guess the way I usually feel about the academic constellation surrounding a work in this case is how I feel about the work itself, since it’s a willing participant in that constellation: it manages to be right on its own terms… but what about the audience’s terms? I feel like those should be the terms that matter. I sound like a Soviet censor, don’t I. Assuming the gawky Lieutenant Kizhe never enters the Criterion Collection, this is the last we’ll be seeing of Sergei Prokofiev. There’s at least a ballet’s worth of music here, mostly of high quality, but not always ideally matched to the action. 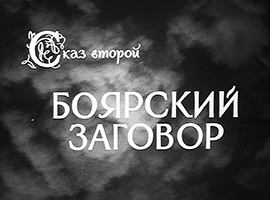 It seems like the timing element was underemphasized in the collaboration between Eisenstein and Prokofiev. It’s pretty clear that Prokofiev just wrote music to descriptions of each scene, not to a particular pacing. The cues all vamp to fill the time, and almost every significant cue comes back again and again verbatim. Frankly there could stand to be even more music. Given the way it plays, I wanted this thing to be wall to wall. It’s such a stage show already. Before I embed any music I have to address the restoration. With Nevsky it was clear that the 80s restoration had resorted to excessive interference in the form of resetting titles and rerecording music, whereas the newer version seemed basically faithful and reliable. In the case of Ivan the situation seems… reversed? Muddier, at least. The 1987 version from the disc has a far inferior image to the 2014 version, certainly, but as I mentioned above, the titles for Part I seemed to have been completely recomposited in the new version, making one wonder just how invasive the restorers allowed themselves to be across the board. The restored color sequence looks truly rich and spectacular, which means I have to wonder how much of that color is authentically recovered and how much is wishfully imposed. With all that digital power it can be very easy to get carried away. In the case of the audio it seems clear that the 80s version is more faithful. The music in the recent version has received heavy artificial sweetening apparently sourced from a modern recording. In several places this has clearly been done without reference to the score, and instruments that aren’t supposed to be playing turn up. Plus the whole thing has been run through some kind of tasteless auto-normalization that makes quiet moments gradually get louder until the hiss is overwhelming, then suddenly drop away when someone starts speaking. There are also places where the dialogue has obviously been re-recorded, I guess to eliminate clipping. Doesn’t seem like a good policy. For example, in the eerie lullaby, the performance is all chopped up. In the original, the singer hums along with the accompaniment, a beautiful and creepy touch that isn’t done in any of the rerecordings because apparently it wasn’t in the manuscript score, and in the 2014 restoration, about half of the humming has been wiped away. Unacceptable! Anyway, it’s tempting to believe that think the version on the DVD is the original recording, intact. And yet at the end, the same restoration-specific credit appears as in the Nevsky disc, identifying Emin Khachaturian as conductor. So, with nothing else to compare it to, I have no way of knowing what we’re really hearing. My gut tells me the following audio, sourced from the DVDs, is at least mostly the original 40s soundtrack recording, overseen by Prokofiev. But consider this all a big shrug of a disclaimer. So here’s some Prokofiev for you. From Part I: the Overture. Here ends the box set. That’s more than enough Eisenstein for me at the moment (and that’s all for The Criterion Collection). Writing about movies that aspire to be texts, that want to be written about, is kind of a drag, and throws me off my game. I feel like Eisenstein and a thousand scholars got there first and are watching me as I react. That’s a burden. We’re about to go through a wacky, pulpy patch in the list. Just in time.